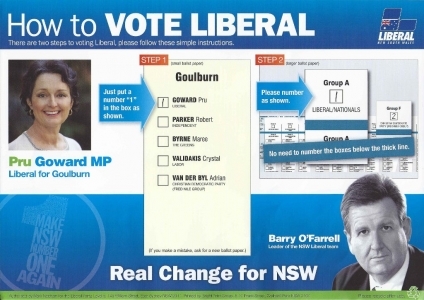 Delivered on Saturday, 26 March, 2011 (approximate), during the NSW State Election 2011. Uploaded on Saturday, 26 March, 2011 at 06:18. There are two steps to voting Liberal, please follow these simple instructions. Just put a number "1" in the box as shown. Please number as shown. No need to number the boxes below the thick line.